Happy Mother's Day weekend to all the mamas out there! Also, to all the women who wish they are moms... my heart goes out to you. 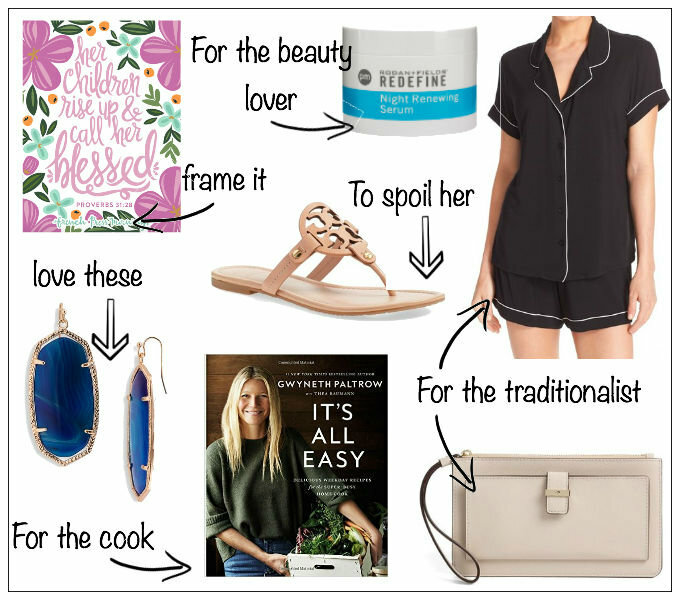 I've rounded up some last minute Mother's Day ideas. Most of these items can be found at Nordstrom, on Amazon, or you can order them and give her a picture :) It's the thought that counts right?? Elise over at Her Heart & Home posted this adorable printable yesterday. I think this would be so cute in a gold/ distressed looking frame. These Kendra Scott earrings are beautiful! I also love these Tori Burch sandals. They are classic and go with everything. Both would be such nice gifts for a mom, especially since they don't spoil themselves often. At least I know my mom doesn't! This cookbook has the most stunning pictures! That's a huge component for me when picking a cookbook. It needs to be appealing to the eye and this one definitely fits that criteria. All of the recipes are low sugar and gluten free. Plus they are centered around quick weeknight meals for a busy person. I love these classic but so comfy looking pajamas. These would be great for a traditionalist or even for someone who seems to have everything. You can never have enough pjs! This Kate Spade wristlet is so cute! A friend at school recently got one and I LOVE it. The design is classic and who doesn't love Kate Spade?? If you're mom loves beauty items or even if she doesn't have any premium products, she needs the Rodan+ Fields Night Renewing Serum in her life. It's the holy grail of anti-aging and feels like silk on your face! Email me if you want some info. I hope you all have a great weekend with your mom!